Whether embroidery is a hobby or a source of income for you, time and time again we find ourselves sitting right back in front of our embroidery machines. Hooping our fabrics and stabilizers, eagerly getting ready to sew out our next project. We all love embroidery for different reasons. For some it may be to relax, for others, it could be to create gifts, or you may simply embroider for your own entertainment. 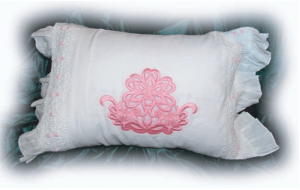 I’m sure you’ll agree that we as embroiderers put tons of time and dedication into our machine embroidery projects. However, let’s face it, as fun as stitching out machine embroidery designs can be… the process can often begin to feel repetitive. Are you tired of simply waiting and watching your designs stitch out in front of you? Do you wish there was more you could be doing to have more fun, and be more creative with your machine embroidery? Well if you’re looking for new ways to be creative with your machine embroidery, you’ve come to the right place! 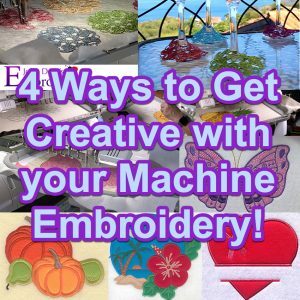 In this article, we’ll go over 4 easy to follow ideas you can do yourself to be more creative with your machine embroidery. Starting off our list, ITH (in the hoop) projects are a fantastic way to have fun and learn some new embroidery techniques. You may be asking yourself “Aren’t all embroidery designs done in the hoop?”, yes, you’re correct. However, an in the hoop project is creating a stand-alone object/item, not just sewing an embroidery design onto a material. For example, for an ITH Christmas ornament, you wouldn’t simply embroider a design onto the ornament, you’d create the ornament itself! Another example would be the wine coasters you see in the image below; you’re creating them entirely on the machine! There are hundreds of projects to choose from including wine coasters, sleeping masks, bookmarks, purses, bags, Christmas stockings/ornaments, key fobs, customizable gifts and so much more! Completing our ITH projects couldn’t be easier! We supply you with step by step videos or instructional PDFs. 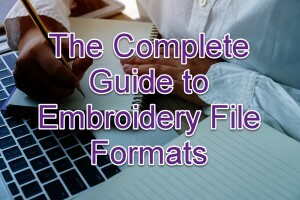 This makes the creation process simple with a step by step guide. This is a great and easy way to try new embroidery techniques and create designs yourself you’d never think possible with your embroidery machine. Want to try an ITH project yourself? Click here to view the 200+ projects we have to offer. When it comes to getting creative with machine embroidery the possibilities are endless. Like many others, I would consider embroidery to be an art form. So why not combine it with another form of art? … painting! 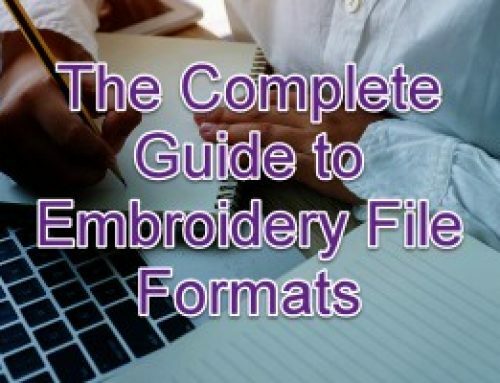 If you’re looking for an embroidery project that is fun and a little more on the artistic side, this technique is perfect for you. Using fabric paint and strategically creating designs that are meant to be painted is a very fun & creative process. Switching between the brush and the machine; painting your embroidery is a great process that allows you to have fun with fabric paints. 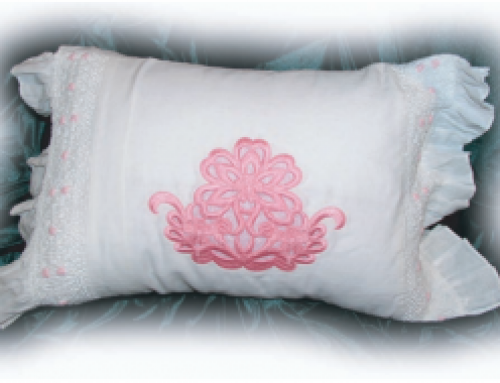 It will also reduce your stitch count, while allowing you to give your embroidery a more realistic look and feel. If that isn’t enough, who didn’t love arts & crafts time in school? Embroidery paintings are also a great home decoration! What’s a better conversation starter than a unique and beautiful piece of art you created yourself? 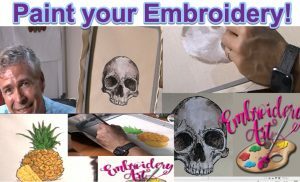 Here are a few video examples you can watch and follow along with to make painting your designs a part of your next embroidery project. 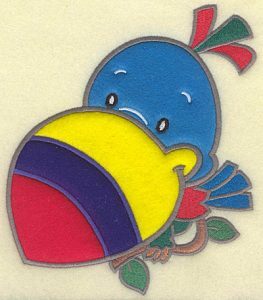 3: Applique Embroidery Designs – Fewer stitches, more fabric. Applique machine embroidery designs are fun… Plus they look and feel great! Not familiar with Applique? In the simplest of terms: Applique are embroidery designs that have smaller pieces of fabric attached and sewn within them. One thing you should keep in mind while learning how to create applique embroidery designs is they are not as hard as they seem! Lot’s of people feel scared when it comes to trying applique because they think it will make the process more difficult when in reality, this isn’t the case. Creating applique embroidery designs can be done easily! 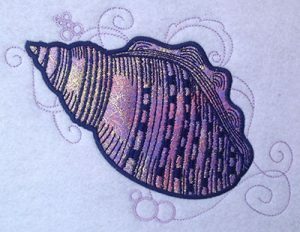 Applique designs are a very popular form of embroidery as they are fun and extremely customizable. They allow you to select whichever fabric type & pattern you’d like to include in your design. 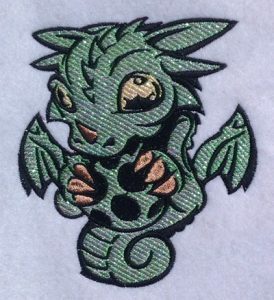 In terms of digitizing, creating appliques is a great way to reduce the total stitch count in a design & still produce beautiful visual effects. 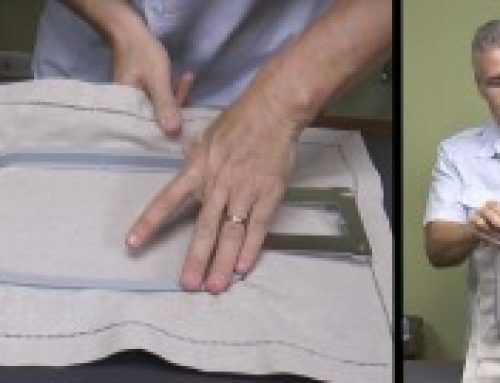 Using an applique technique allows you to replace larger fill areas with a simple sheet of fabric. By doing this you will have less run time on your machine without sacrificing the look of a design. 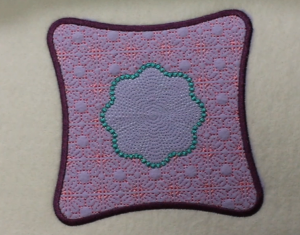 For a full detailed step by step applique tutorial click here. Would you like to create this custom applique design? Simply click here to watch a FREE video tutorial taught in Hatch. Don’t have Hatch software? No problem, click here to download your 30-day FREE trial of Hatch. 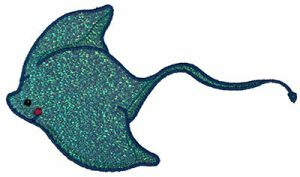 Mylar Embroidery designs are relatively simple and are an extremely effective way to add some shimmer to your designs and make them look incredible! 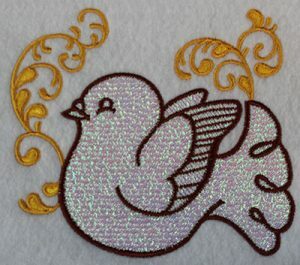 Mylar designs have gained tons of popularity over recent years as they’re an easy way to add some sparkle and color to your next embroidery project. 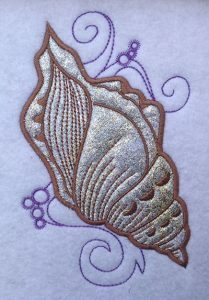 Instead of using metallic embroidery threads, try using mylar! It’s a more affordable alternative which also adds a glitter like appearance to your designs! Mylar itself is a shiny plastic film that is used for many things, not only embroidery. Keep this in mind when purchasing mylar for embroidery, you want to purchase the thin sheets which can often be found in the wrapping paper aisle of craft stores. Note: Do not purchase mylar balloons and try to use these on your embroidery machine. The material in the balloons is far too thick and it will not give the same effect and results as the sheets. An incredible benefit of using mylar is that in terms of color, it has a 1 size fits all approach. 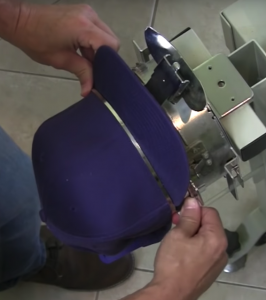 You don’t have to buy separate colors of mylar, instead, mylar picks up and reflects whatever color of thread you’re using it with! 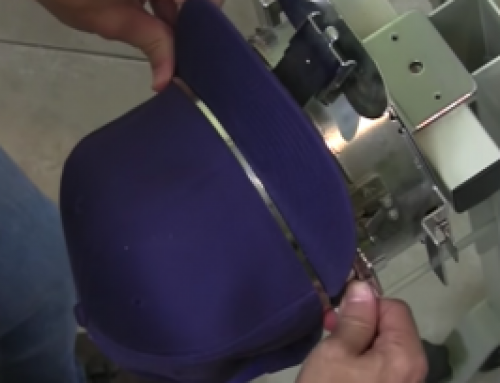 This means that after initially tacking the mylar down with stitches, you can let your machine run normally without having to add in multiple pieces of materials. If you’d like to give mylar embroidery designs a try, click here for a video tutorial showing you the stitch settings for digitizing with this technique. For a written step by step design tutorial click here. You no longer have to wait around while your machine does all the work, using these simple ideas you can create incredible designs that require more than just hooping and hitting the start button. Use these ideas next time you start an embroidery project and take pride in what you’ve created! Don’t be afraid to share your results… Remember, machine embroidery and embroidery digitizing is all about having fun, there are no wrong ideas. You can use these tips and implement them into your own project. A big part of being and getting creative with your embroidery is using your own imagination! Using his imagination while digitizing allowed John to win multiple awards in the home and commercial industry. 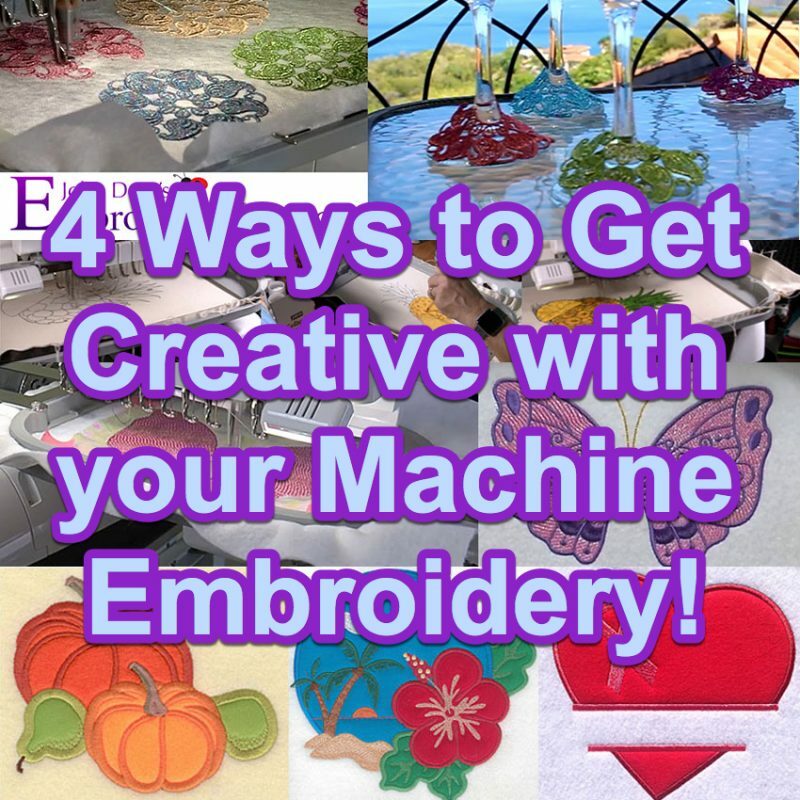 You now have some new creative ideas you can implement in your machine embroidery today… Be sure to comment below & let me know which one you plan on trying first?